NASA astronaut Scott Kelly and Russian cosmonaut Mikhail Kornienko lifted off Friday from Baikonur Cosmodrome in Kazakhstan to spend almost a year on the International Space Station. Kelly’s long sojourn in space will beat the U.S. record for longest-duration spaceflight by more than 100 days. Kelly and Kornienko will be closely monitored for studies aimed at determining the effect of long-term spaceflight on the human body. Former astronaut Mark Kelly, Scott Kelly’s identical twin, will be monitored on Earth as a control subject for the unusual yearlong experiment. Still no word on when a cat will get a chance to go to space, and from the looks of Commander Kibble (above), the technology and funding are still lagging for this important scientific endeavor. 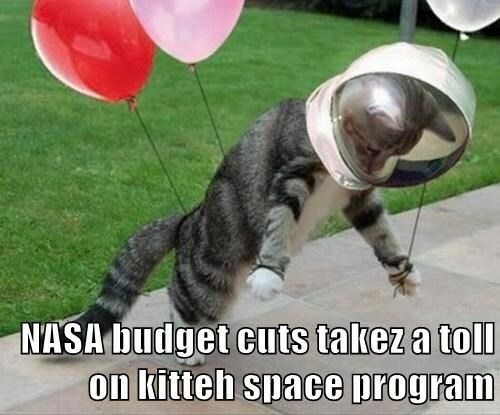 This entry was posted in Science Caturday, Uncategorized and tagged astronaut cat, ISS cat, science cat, Space Cat. Bookmark the permalink.